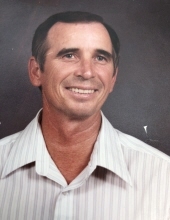 Allen Dale Rhoads, age 80 of Breckenridge, passed away Tuesday, April 2, 2019, Graveside services will be held at 11 a.m., Friday, April 5, 2019 at the Burkett Cemetery in Burkett, Texas with Pastor Charles Kuhn officiating. Visitation will follow that evening from 6 p.m. to 8 p.m. at the Melton-Kitchens Chapel. The service is under the direction of Melton-Kitchens Funeral Home. Allen Dale Rhoads was born July 18, 1938 in Coleman, Texas to Luther and Addie Rhoads. He went to school and graduated in Burkett High School. Allen moved to Breckenridge in 1960 to work for R.E. Dye Manufacturing as a Machinist. He retired as the VP of Productions after 54 years. Anyone that knew Allen knew that he was one of the kindest, gentlest and moving souls around. He loved spending time with his wife, Edna and his family, watching sports on TV, especially anything related to golf alongside his two poodles which he adored. Allen enjoyed playing golf at the Breckenridge Country Club where he was a long time member, as well as instrumental in many improvements to the course over the years. He introduced many people to the game he loved, always willing to give free lessons to anyone. If he wasn’t at the Golf Course in his spare time he was trying to catch catfish at the lake or river. He recently fulfilled a “Bucket List” item of fishing for big cats on Lake Texoma. He was preceded in death by his parents, Luther and Addie Rhoads; his first wife of 49 years, Noreen “Tootie” Rhoads; brother, Mickey Rhoads and a great grandson, Gavin Michael. Allen is survived by his wife, Edna Rhoads of Breckenridge; daughters, Cindy Parsons and husband, Rocky of Albany, Debbie Lowke and husband, Stuart of Argyle, Texas; sons, Randy Rhoads and wife Kimber of Houston, Texas, Michael Rhoads and wife, Sherry of Cincinnati, Ohio, Michael Brest and wife, Valerie of Raleigh, North Carolina, Robert Brest and wife, Karen of San Angelo, Texas, Tracy Allen Brest of High Point, North Carolina; sister, Coralea Keifer of Anadarko, Oklahoma; brother, Roy Rhoads of Coleman, Texas; twenty-one grandchildren and eleven great grandchildren. Memorial contributions can be made to the American Cancer Society, Charity of Choice or donate blood to a local Blood bank and may be left at the Melton-Kitchens Funeral Home. Condolences may be made online at www.meltonkitchens.com. Donor can choose their charity of choice or donate blood to a local Blood Bank. "Email Address" would like to share the life celebration of Allen Dale Rhoads. Click on the "link" to go to share a favorite memory or leave a condolence message for the family.